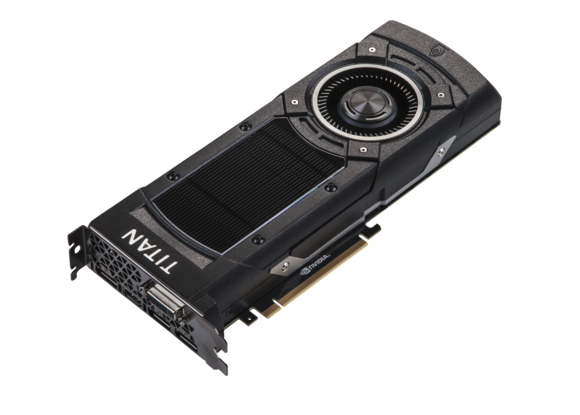 The graphics war continued unabated on Tuesday, as Nvidia yanked the curtain up on its $1,000 GeForce GTX Titan X, a video card that has already been declared the new king of the gaming GPUs. The Titan X packs a whopping 12GB of GDDR5 memory on board and more than 33 percent more shaders than the company's current top-end Maxwell GPU, the GeForce GTX 980. Nvidia's new GeForce Titan X has been crowned the new king of gaming GPUs. That 12GB of RAM is the real eye opener, as no consumer-level, single-GPU graphics card has packed that much RAM before. While seemingly excessive, the 12GB of RAM allows the card to operate at ultra-high resolutions and with crazy amounts of memory-hogging image filtering. In fact, our review—which you can read right here—validates Nvidia's claim that the Titan X is the first single-GPU card capable of playing top games at 4K resolution and high graphics detail settings. It also easily bests the top single-GPU cards from AMD and Nvidia's previous king, the GeForce GTX 980. The key word here is "consumer-level," of course. Many gamers will scoff at the mention of the Titan X even being considered a consumer card, as it will cost a premium over the GeForce GTX 980 card already available for $550 and up. Pricing is another touchy matter for the Titan X. Despite dropping a bomb by surprise announcing the card at the Game Developers Conference, hard details of the card were not revealed. Eventually Nvidia pre-briefed media outlets and sent out review cards, but the $1,000 pricing of the card remained a closely held secret, only unveiled to the world by Nvidia CEO Jen-Hsun Huang during his GPU Technology Conference keynote on Tuesday. The reason for the pricing being held so closely to the vest is likely due to two factors: The first is maneuvering room in its ever-constant war with graphics chip vendor AMD. By holding the price of the GPU until the very last minute, Nvidia can react to moves by AMD, which is also preparing a new high-end graphics card. The second reason is to prevent further leaks, as loose lips have haunted the company for its last few major GPU launches. Despite fairly tight security, details and presentations for the GeForce GTX 980 leaked out before the official announcement. With the Titan X, during a press briefing at GDC, the press was only allowed to scribble notes of the card's specs and capabilities rather than receiving the customary copy of the presentation given under strict non-disclosure agreement. It was supposed to minimize leaks—but the security procedures didn't help. Specs for the Titan X as well as purported benchmarks of the card were leaked to the web over the previous weeks anyway. Do you even Titan brah? The Titan lineup itself has always lived in an odd place between GeForce cards aimed at gamers and the Tesla and Quadro lines aimed at professional and Enterprise users. The original Titan, for example, was released in early 2013 for $1,000, and few thought gamers would buy them. Yet the cards were surprisingly popular for the ultra-enthusiasts who just wanted to go to 11—even if doing so cost 50 percent than with a card that went to 10. Graphics analyst Jon Peddie of Jon Peddie Research said that while it may surprise Joe Six Pack gamer griping about the card's price on an Internet forum, ultra-enthusiast cards have sold relatively well and that doesn't appear to be stopping. "The Titan X is in the enthusiast class gaming AIB category. That segment has grown steadily for the past 15 years, not dramatically—a few points a year—but growing, compared to the gentle decline overall in PC sales," Peddie said. "The Titan, and all high-end (add in boards), whether gaming GTX AIBs, or Quadro (work station) AIBs, are extremely important to Nvidia because they generate the highest revenue and the highest profits," he continued. "Also, they feed and demand the R&D investment. It’s those segments, and the hundreds of millions of dollars Nvidia invests in advancing GPU technology that keeps the company out front, and raises the performance levels in the industry." 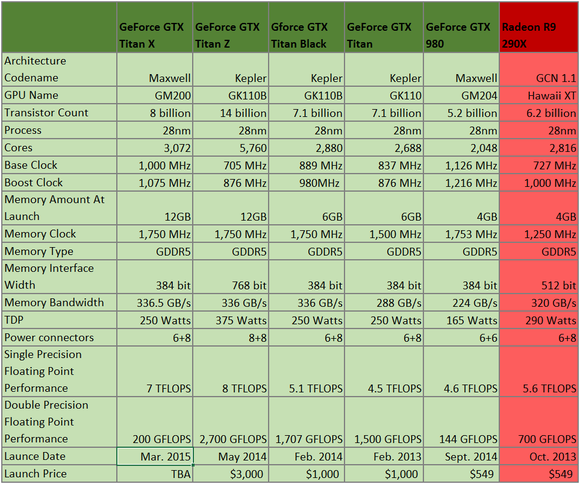 The GeForce Titan X in the buff reveals massive amounts of GDDR5 memory around one massively huge die. 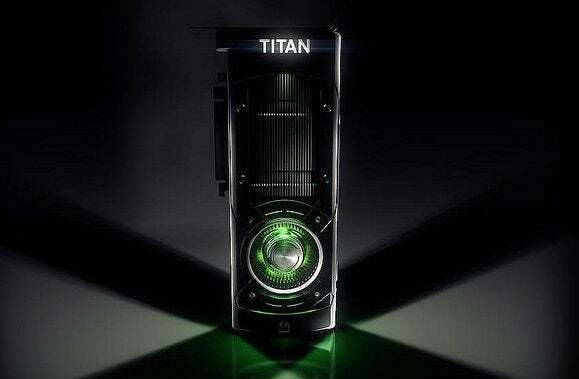 Titans have also been surprisingly popular among developers using Nvidia's GPU-based computing platform, called CUDA. Even at $1,000, Titans are a magnitude cheaper than the company's Quadro and Tesla professional graphics card lines. This value has even withstood the test of time. The original Titan, going on two-years old, can still sell for nearly its original price. Much of that comes from the Titan's double-precision floating point performance. Like all chip companies, Nvidia will take a chip and intentionally downgrade its performance or switch off features. For example, the GeForce GTX 980 equals the two-year old Titan in single-precision floating point performance, but its double-precision floating point performance is 144GFLOPS vs. the 1,500 GFLOPS of the now-ancient Titan. 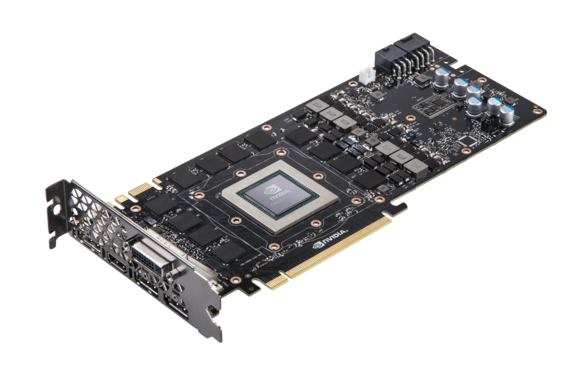 The GM204-based GeForce GTX 980, for example, is rated at 144GFLOPS double-precision performance while the older GK110-based GeForce GTX 780 Ti is rated at 210GFLOPS. Even the standard GeForce GTX 780 aces the current top gun gaming card, pushing 166GFLOPS. Where will the Titan X fall? 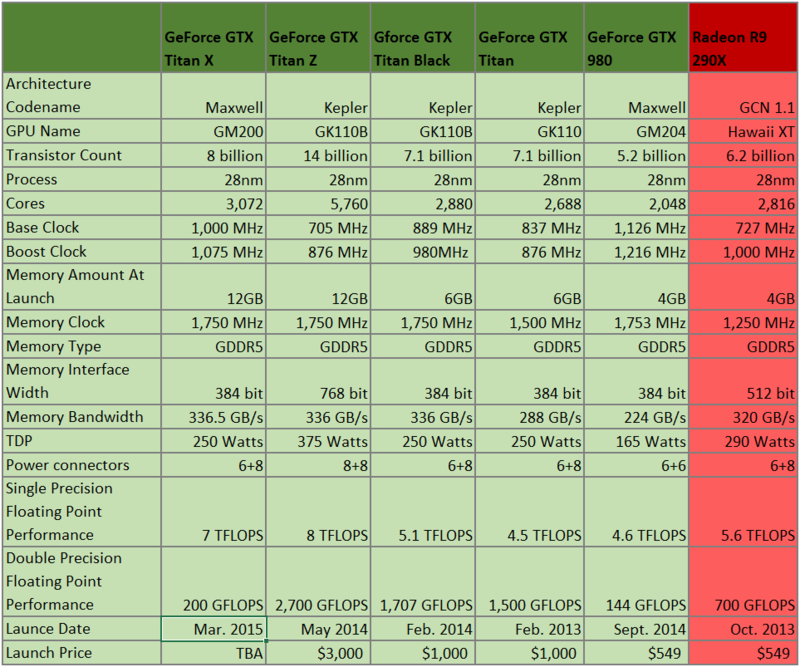 Speculation that the Maxwell-based Titan X would be somewhat disappointing for compute purposes were confirmed at GTC. During Huang's keynote, he said that the Titan X is made for single-precision floating point for performance. For double-precision, he said, Nvidia still offers the Titan Z, which packs a pair of those older, more precision-pushing GK110 chips. Much of this may be hand wringing over nothing though. As Nvidia hasn't introduced a professional card using the equivalent GM200 core yet, it's possible the company has simply locked up the functionality and will switch it on when needed. Nvidia also has more to worry about from AMD. Even though Nvidia has enjoyed a lengthy time at the top and nearly a two-to-one lead over AMD in the discrete graphics sales in recent years, it's clear a new AMD GPU will be tipping soon. After Nvidia unexpectedly outed Titan X, AMD officials began telling the press that they had some secrets there too: One of GDC's VR demos was being powered by the next-generation flagship Radeon card. Like other media outlets, I asked to see the card and was denied. Even a glimpse of the back of the computer was denied. When I pointed out that for all I knew, it was a Radeon R9 290X inside, I was told to simply take them at their word for it. 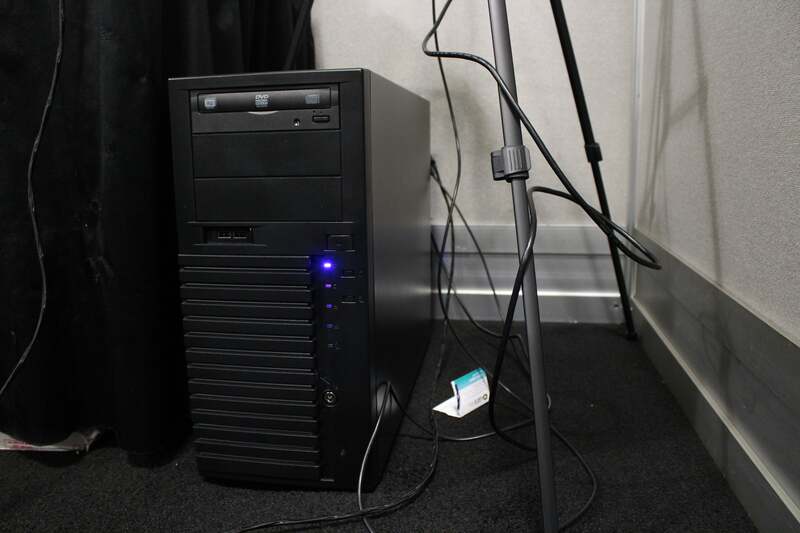 This picture of this intentionally sedate PC is as close as I could get to the company's next-gen part. AMD's next-gen GPU was also secretly powering many of the demonstrations at this year's Game Developer's Forum. Normally, such a move would be dismissed as saber rattling or trying to pathetically get back into the limelight after Nvidia's surprise Titan X announcement, but the wide "I just ate the canary" grins from the AMD officials tell me it was real. AMD hasn't been immune from the leaks that have haunted Nvidia either. From performance benchmarks to reports of crazy amounts of memory bandwidth powered by stacked memory techniques and next-generation super wide memory buses, the problem AMD faces with its supposed Radeon 390X is uncontrolled hype. If the card doesn't come out and offer "60 percent" more performance than its top GPU or wipe the floor with the Titan X, the public is likely to be highly disappointed even if it is a competitive GPU. Still, today is about the GeForce Titan X. Despite the leaks, and despite fears about its compute prowess, the Titan X appears to be everything Nvidia has pitched it as so far: the world's most powerful gaming GPU.